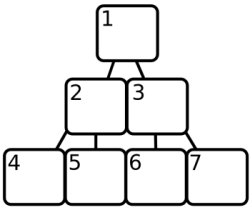 In chapter 7, the binary heap was introduced as a method to store a collection of objects in such a way that the smallest element can be quickly found. As promised, this appendix will explain the details behind this data structure. Consider again the problem we needed to solve. The A* algorithm created large amounts of small objects, and had to keep these in an 'open list'. It was also constantly removing the smallest element from this list. The simplest approach would be to just keep all the objects in an array, and search for the smallest one when we need it. But, unless we have a lot of time, this will not do. Finding the smallest element in an unsorted array requires going over the whole array, and checking each element. Such structures are usually called trees, because of the way they branch. Now, when you need the smallest element, you just take off the top element and rearrange the tree so that one of the top element's children ― the one with the lowest value ― becomes the new top. When inserting new elements, you 'descend' the tree until you find an element less than the new element, and insert it there. This takes a lot less searching than a sorted array does, but it has the disadvantage of creating a lot of objects, which also slows things down. Finding the smallest element is now a matter of taking the element at position 1. 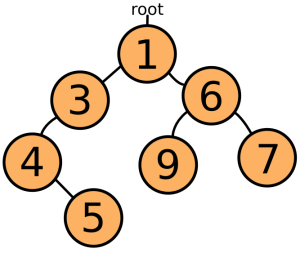 But when this element is removed, the heap must make sure that there are no holes left in the array. To do this, it takes the last element in the array and moves it to the start, and then compares it to its child elements at position 2 and 3. It is likely to be greater, so it is exchanged with one of them, and the process of comparing it with its children is repeated for the new position, and so on, until it comes to a position where its children are greater, or a position where it has no children. Take out 2, move 6 to the front. 6 is greater than its first child 3, so swap them. 4, so we swap again. Similarly, when an element has to be added to the heap, it is put at the end of the array and 'sunk' down by repeatedly exchanging it with its parent, until we find a parent that is less than the new node. Element 2 gets added again, it starts at the back. than 2, so we swap. The parent of position 3 is position 1. Again, we swap. The element can not sink below position 1, so we are done. Note how adding or inserting an element does not require it to be compared with every element in the array. In fact, because the jumps between parents and children get bigger as the array gets bigger, this advantage is especially large when we have a lot of elements1. Here is the full code of a binary heap implementation. Two things to note are that, instead of directly comparing the elements put into the heap, a function (scoreFunction) is first applied to them, so that it becomes possible to store objects that can not be directly compared. // Add the new element to the end of the array. // Allow it to sink down. // Store the first element so we can return it later. // Get the element at the end of the array. // start, and let it bubble up. // to fill up the hole. // Fetch the element that has to be sunk. // When at 0, an element can not sink any further. // Compute the parent element's index, and fetch it. // Swap the elements if the parent is greater. // Update 'n' to continue at the new position. // Found a parent that is less, no need to sink any further. // Look up the target element and its score. // Compute the indices of the child elements. // Look it up and compute its score. // If the score is less than our element's, we need to swap. // Do the same checks for the other child. // If the element needs to be moved, swap it, and continue. // Otherwise, we are done. The amount of comparisons and swaps that are needed ― in the worst case ― can be approached by taking the logarithm (base 2) of the amount of elements in the heap.